Left: the 9/11 Memorial site in 2009. Photo by Joe Wool. Right: the 9/11 Memorial site in 2018. Photo by Jin S. Lee, 9/11 Memorial. A worker from Rock of Ages uses a torch to fuse a granite monolith for the 9/11 Memorial Glade. Photo courtesy of Association Press/Lisa Rathke. View from the south pool on the 9/11 Memorial plaza. Photo by Jin S. Lee, 9/11 Memorial. Left: A Y2K hat worn by Morgan Stanley Dean Witter staff, belonging to Nicholas Craig Lassman. Right: A portrait of Richard Cyril Rescorla. Collection 9/11 Memorial Museum. VICE correspondent Isobel Yeung in conversation with Director of Public Programs Jessica Chen. Photo by Monika Graff. A rendering of the Memorial Glade, produced by MOSO Studios for the National September 11 Memorial & Museum. A portrait of Lindsay LeBorgne currently on view in the exhibition "Skywalkers." Tintype by Melissa Cacciola. Reproduction photography by by D. Primiano. 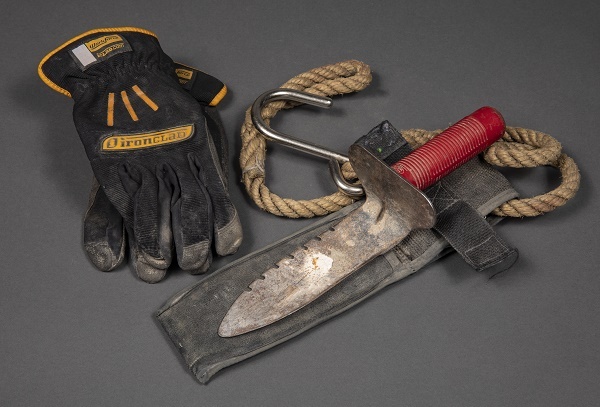 New artifacts have rotated on view in the 9/11 Memorial Museum's historical exhibition. The Army and Navy college football teams stood together for the U.S. national anthem before their game on Dec. 1, 2001. Photograph by Mark Peterson/Corbis, Getty Images. Secretary of Homeland Security Kirstjen M. Nielsen and Executive Vice President and Deputy Director for Museum Programs Clifford Chanin at the inaugural Summit on Security. Photo by Jin Lee, 9/11 Memorial.